TRUCKADS® CHANGEABLE FRAME KITS AND VINYL BANNERS. ORDER ONLINE TODAY! It does not damage trucks (no holes) and fully complies with USDOT truck width restrictions. TRUCK ADS® Invisa-Frames are tested safe & stronger than METAL! PATENTED LIGHT WEIGHT SLIM DESIGN. Slim profile frame projects just 3/16" from mounting surface. Safe in extreme weather conditions and high speeds. Compare TRUCK ADS® Invisa-Frames with competitor's outdated metal technology. TRUCK ADS® Invisa-Frames & Banners ~ LOW PRICE GUARANTEE! More facts about our banner mounting frame system. All Standard Sizes Available. No Up Charge for Custom Sizes! The strongest commercially manufactured truck media frame system and heavy duty 18 ounce vinyl with scrim. install the TRUCK ADS® Frame Kit. The only tools you need! when the banner is attached. DO IT YOURSELF AND SAVE! ORDER ONLINE TODAY! No more drilling, sawing, screwing, grinding, refinishing or clean-up with our easy installation system! The TRUCK ADS® Invisa-Frame Kit is patented in the U.S. and Canada. It is the only "completely invisible" vinyl billboard banner frame track system commercially available for signs on semi trailers and straight truck bodies. It is the next generation truck wrap kit, attached only with adhesive. Time consuming labor (drilling, grinding, screwing and clean-up) associated with other interchangeable truck signage frame systems is eliminated. Damage from adhesive truck decals is eliminated, too. Also, the system is popular with grand format printers of large advertising banners that require attachment to fixed walls. TRUCK ADS® billboard banners appear "frameless" and the "stick and peel" technology does not damage the substrate. TRUCK ADS® Invisa-Frame Kits for truck side advertising, wallscapes and many indoor and outdoor large format advertising applications come in easy to install kits and include the FRAME, SECUR-TABS® and ACTIVATOR™. TRUCK ADS® patented frame is a rivet-free, bolt free, screw free, vinyl banner media frame system that is stronger than metal banner frame connections. Our trailer frame kits are made from a hard durable polymer that affixes banners invisibly to trucks, buses, walls, billboards and more. Incredible adhesive strength guarantees a secure bond of the truck banner hardware in temperatures ranging from -40° to 200°F. The vinyl banner can be reinstalled 100's of times and adhere to metal, fiberglass and other non-porous surfaces for long term reusability. Installation time for the TRUCK ADS® system after the mounting surface frame has been installed is cut in half when compared to typical metal billboard frames. It is quick and easy. A two-three man team can complete a new frame installation on a 53 foot semi-tractor trailer in as little as 1 hour per side. Frame removal is even quicker. 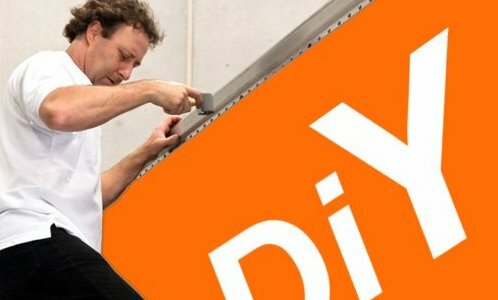 One person can remove a 53' banner in 15-20 minutes. Besides trucks, vans and walls, our frame kits make great bus AD frames. Once installed, the AD frame and banner projects just 3/16" from the mounting surface and it is completely hidden (invisible) because the banner covers the frame! SECUR-TABS® combine safety and esthetics to make the TRUCK ADS® Invisa-Frame Kit the gold standard of truck wrap kits. TRUCK ADS® patented frame system with SECUR-TABS® fasteners hold 50 lbs. of "sheer" weight per square inch of surface area. That's a lot of holding power. SECUR-TABS® are the secondary locking device that prevents the migration of the snap lock frame due to the constant vibration of a moving truck. SECUR-TABS® slide lock technology is easy to attach and detach banners as often as you like. The frame system is reusable 100's of times! The frames were successfully tested on trucks with speeds up to 75 mph for consistent periods and 120mph impact speed with 2 vehicles passing very close to each other. Aerodynamic and mechanical loading tests that were conducted, concluded the frame held strong at simulated speeds up to 140 mph and simulated distances up to 200,000 miles. All TRUCK ADS® Frame Kit components have successfully withstood the test of real time miles (284,000,000 miles over 10 years) in normal and extreme weather, including rain, high winds, extreme heat and extended periods of freezing temperatures. "The frame adhesive was put through rigorous strength tests by an independent engineering and testing firm." USE ONLY TRUCK ADS® CERTIFIED FRAME KIT FOR BANNERS ON VEHICLES. KIT INCLUDES TRUCKADS® PATENTED FASTENER TECHNOLOGY, PRODUCT LIABILITY INSURANCE AND A LIFETIME REPLACEMENT WARRANTY. COMES COMPLETE AND READY TO INSTALL ON SMOOTH, NON-POROUS, FLAT AND SECURE MOUNTING SURFACES. 1. TRUCKADS® banner mounting system is made entirely of high tech polymers that are recyclable. 2. TRUCKADS® truck media system is the best way to mount a banner and comes with a lifetime frame warranty and replacement guarantee. 3. TRUCKADS® banner track mounting system, when attached to both sides of a 102" inch wide truck does not exceed USDOT truck width restrictions of 102.36" inches. 4. TRUCKADS® changeable advertising system "breathes with the truck" and remains firmly fixed to the side while the truck twists, bends and torques, mile after mile after mile. 5. TRUCKADS® flex sign frame does not damage the truck, bus or wall when installed on a door or sides and repairs to the truck or wall are non-existent upon removal. 6. TRUCKADS® truck mount flex frame banner system positions the banner less than 1/4" from the truck, bus or wall and causes no wind drag or added fuel costs. See comparison chart below. 7. TRUCKADS® frame system is patented and forces the vinyl sign to hug the sides of the truck and never needs re-stretching. 8. TRUCKADS® truck framing system remains clean and free of dirt and road grime and never requires more than one person to remove it. Usually in 15 minutes or less. 9. TRUCKADS® vinyl banner frame system is a do it yourself (DIY) kit. Change Out installation kits only require a pair of scissors to cut the frame and a rubber roller like this, to install it. 10. TRUCKADS® vinyl sign system costs less to repair, if a secondary object strikes and damages the frame. 11. TRUCKADS® outdoor banner frame system does not cause the banner graphics to bang in the wind and always keeps the vinyl quiet at any speed. 12. TRUCKADS® frame system is the only completely hidden banner frame for trucks on the market. 13. TRUCKADS® banner frame can be custom fitted to follow along the round bull nose truck frame often located at the top front corner of a box truck. 14. TRUCKADS® removable sign for trucks is attached to the side of 100's of box trucks and semi trailers (284,000,000 miles and over 10 years), without one failure. 15. TRUCKADS® vinyl sign system weighs less and causes no added fuel costs due to weight. See comparison chart below. 16. TRUCKADS® changeable truck sign system helps fleet owners sell their AD space. 17. TRUCKADS® invisa-frame system weighs only 17 pounds for both sides of a 53' trailer and when you add in the 2 banners, weighs a total of 118 pounds. It is the most fuel efficient truck media system manufactured today. See comparison chart below. 18. TRUCKADS® frame skin system can remain on a bus or truck without the vinyl in place and not increase wind drag or cause frame system failure. 19. TRUCKADS® billboard banner frame is stronger than metal frames. Before choosing which truck banner frame system is right for you, stop and calculate the total cost of ownership for banners and frames. Truck sign systems weighing 225 pounds up to 450 pounds for 2 frames and 2 banners on a 53' truck cost 2.5 to 4 times more in fuel loss in just the first year, than TRUCKADS® FRAME SYSTEM. Compound this cost over 3 years and the cost differences are enormous. TRUCKADS® invisa-frame is completely smooth and aerodynamically enhances airflow, thus offsetting the weight of the materials. "An extra 100 pounds added to your vehicle could reduce your MPG by 1 percent. The reduction is based on the percentage of extra weight relative to the vehicle's weight and affects smaller vehicles more than larger ones." Semi-Tractor Trailers Average: 9 MPG/110,000 miles per year. Fuel Consumption Annual Average: 12,222 Gallons per year. *ZERO out added fuel consumption cost. TRUCK ADS® Invisa-Frame is the most fuel efficient truck banner frame system manufactured, based on weight and profile. Achieve improved aerodynamics due to streamlining the truck sides (frame does not project beyond the banners) and banners don’t bang in the wind. If you find a better price for frames and banners from any of our competitors, TRUCKADS® will beat it by 5%. Competitive quotes must be current (30 days), in writing and road worthy. What You Need to Know about Metal Frames. 23. Kwik change banner rail frame systems require you to drill holes in the truck, bus or wall to install and use an expensive tool (shown here) for installation. 24. Metal banner frame systems have failed (rivets loosen and break over time) because the frame is rigid and does not "breath with the truck" as the truck twists, bends and torques mile after mile. 25. Metal flex banner frame systems require a saw, electric drill and an expensive custom tool kept with each truck, just to install the banner. See press release. 26. Metal stretch banner frames position the banner 3/8" to 1-1/2" from the truck and causes wind drag and added fuel costs. 27. Metal flex face mounting systems for banners need to be stretched and re-stretched (banner stretching frame) over time to prevent wind from making the sign slap against the truck side and cause a banging noise. 28. Metal stretch banner systems get dirt with road grime embedded in them, requiring 2-3 men working together (labor costs skyrocket) to break the vinyl banners loose from the banner zip track mounting system. 29. Metal banner stretching traxx frames cost more to repair when an object damages the sign frame? 30. Metal stretching media frames cannot be custom fitted to the rounded bull nose truck frame often located at the top front side corner of a box truck. 31. Metal trailer skin banner frame systems weigh a lot more than TRUCKADS® Frame System and contribute to increased fuel costs. 32. Metal vehicle banner sign holders are tedious and slow to install, very visible, industrial looking and heavy. 33. Metal frame systems, (if the sign is not in place at all times), contribute to higher fuel consumption and potential failure of the frame system due to wind drag. 34. Metal ages quickly in the outdoor environment and becomes pitted, rusted and weakens over time. See independent strength comparison test. TRUCK ADS® Frames are safer, more durable, more fuel efficient, lighter weight, easier to install and cost less! *Metal used in competitors frames weigh 10 times more than TRUCK ADS® Frame System.